Intuitively Designed for Top of the Line Performance and Protection ADATA SD700 water/dust/shockproof ruggedized portable Solid State Drive utilizes advanced 3D NAND Flash technology which improves overall durability and reliability with capacities up to 1TB and read speeds of up to 440mb/s (or 4 times faster than conventional HDD). Comprehensively Certified To offer genuine all-terrain protection against harsh weather elements including water, mud and sand, ADATA SD700 is IEC IP68 protection standards certified for keeping water and dust out. ADATA SD700 will function properly even after being submerged under four feet of water for over 60 minutes. ADATA SD700 is also tested to meet U.S. military specification MIL-STD-810G 516.7 Procedure IV (Transit Drop), capable of maintaining full functionality after being dropped from a height of four feet on each of its six faces, 12 edges and eight corners for a total of 26 drops. Versatile and Easy to Use ADATA SD700's fast USB 3.1 Gen 1-interface features plug-and-play operation and cross-platform compatibility with Windows, Mac OS, Linux and Android. 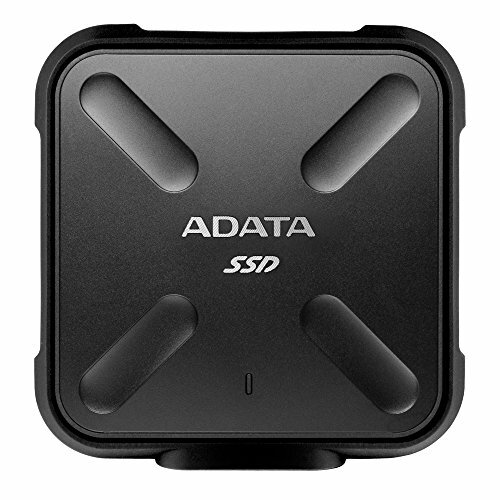 At just 3.5oz, ADATA SD700 is lightweight and compact compared to an external HDD. Without moving mechanical parts inside, ADATA SD700 is also completely silent, durable, and more reliable than conventional HDD. ADATA SD700 comes with 3-year limited warranty for worry-free ownership experience. All certifications and test results were conducted under standard test conditions with the port cover properly sealed and are intended to protect product against accidents during normal use, do not intentionally drop or submerge the product under water.